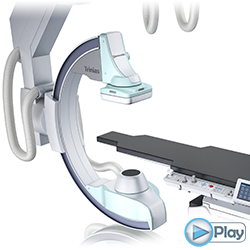 The Trinias unity edition Ceiling Mounted system has been developed for optimal support of cardiovascular procedures with easy positioning and excellent visibility of fine blood vessels and devices across the entire field of view. The advanced design of the Trinias unity edition ceiling mounted C-arm provides transverse movement for easy Radial and Brachial approach, providing fingertip-to-fingertip coverage during examinations. SCORE CT is CT-like imaging. This 16 bit image processing technology is an application for observing cross-sectional images of low contrast regions. The application has 2 use modes depending on the procedure and radiographic region of interest. Axial, coronal and sagittal images are displayed automatically after radiography. SCORE Navi is a 3D RoadMap function. Linkage with table movement is also available. SCORE Navi/Navi+Plus is an application utilizing pre-procedure images to support minimally invasive interventions. By synchronizing the C-arm projections to pre-procedure MDCT images, the system enables them to be used as a reference during interventions, reducing contrast media usage and X-ray dose. Registration of the MDCT and fluoroscopy images is easily achieved by performing fluoroscopy in 2 directions, and the system will perform automatic alignment. The software can also overlay images onto fluoroscopy, which allows adjustment of the rate of blending. The Navi+Plus application also includes a virtual stent feature to simulate the stent size and placement position before carrying out a procedure. A wider FOV 16 x 12 inch FPD is now available. By using the FPD rotation, an enhanced crossover solution is available which is applicable for cardiac, neuro, abdominal and peripheral regions. The ceiling-mounted C-arm can be moved horizontally in both longitudinal and lateral directions at every C-arm position in the Trinias unity edition C12/C16. The floor type Trinias unity edition F12 C-arm with 6 pivot unique movement enhances the wide coverage, which breaks through the stereotype of Flooring C-arm coverage.